Northeast India is a very different, special corner of India that still makes it on few people’s itineraries. Surprisingly enough, because the region’s infrastructure is booming these days, and begging to be discovered. 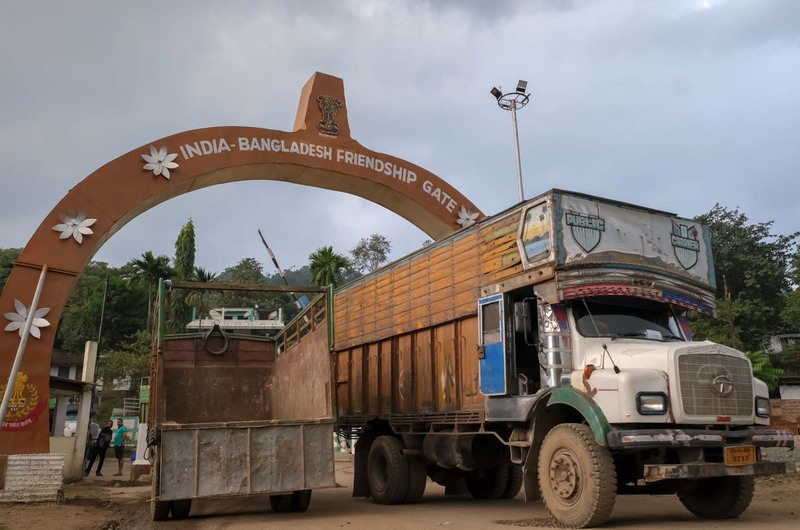 The formerly inaccessible border between India and Myanmar is finally open to foreign tourists in both Manipur and Mizoram. And the government of India is hard at work to improve roads, infrastructure, and railways, all to boost tourism to the region. Are you convinced? Read on. First-time visitors to India may prefer to go to more famous hill stations elsewhere in North India, but we suggest you consider stepping out of the tourist trail and experience some of the many amazing places to visit in Northeast India. With the Himalayan peaks and river valleys of Arunachal Pradesh, Assam’s plains, tea estates and national parks, the mighty Brahmaputra river, the former head-hunting hills of Nagaland, and the ancient Khasi culture of Meghalaya, with their living root bridges, it’s hard to pick any highlights to visit while in this region. We have visited Northeast India twice: once in 2012, when the region finally levied access permits, and more recently in November 2018. The place has changed, but not drastically, and there’s a better tourist infrastructure, including a series of reliable tour operators like Greener Pastures and the Holiday Scout. You can, of course, travel independently: travellers buy or rent motorbikes (Shillong is the easiest place to get a bike, contact Pathfinders Adventures), use public buses and jeeps, and also the basic rail network connecting Guwahati in Assam to Jorhat, Sibsagar and Dimapur in Nagaland, or New Jalpaiguri and the rest of west India. And in the Northeast, traveling on a sleeper train is actually cleaner than elsewhere in India. Northeast India experiences a strong monsoon season in the summer. Rains quiet down around September, but may as well drag into October. Given the dire conditions of some roads, it’s recommended to wait a bit longer. November is a great time to visit, with milder temperatures in the plains of Assam, and cool weather in the hills. December starts getting cold, but it’s also the best time for clear skies and mountains views, especially in Sikkim. Comes January, and the temperatures plummet below zero, especially in the high-altitude mountain regions of Arunachal Pradesh. It’s best to go somewhere else hotter in India and visit the Northeast again from mid-March to the end of May. DO YOU LIKE THIS GUIDE? PLEASE PIN ME TO YOUR PINTEREST BOARDS! 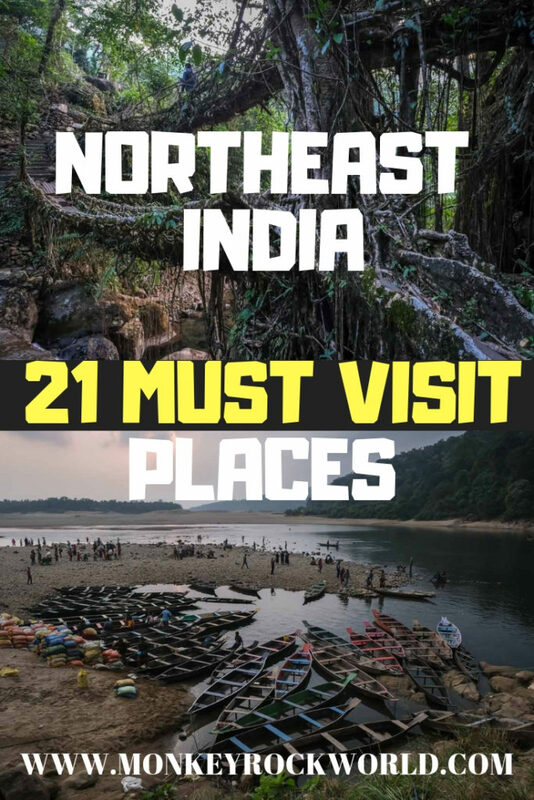 What are some of the best places to visit in Northeast India, those who cannot be missed on any Northeast India trip itinerary? With so much on offer, it’s a tough choice: anyone will give you different suggestions, for the whole region is worth exploring, with so many hidden gems and personal favourites. But where to start if, let’s say, you only have 2 weeks for your itinerary in Northeast India? The following suggestions are well worth considering for your itinerary. Please note that places in the states of Tripura and Mizoram are not included. Reason? We don’t think the first would make an essential stop in a first-time visitor to Northeast India itinerary, and we simply have not been to Mizoram… as of yet. We’ll update this as soon as we do. You’ll certainly pass through Guwahati, the main hub to enter or exit the region. 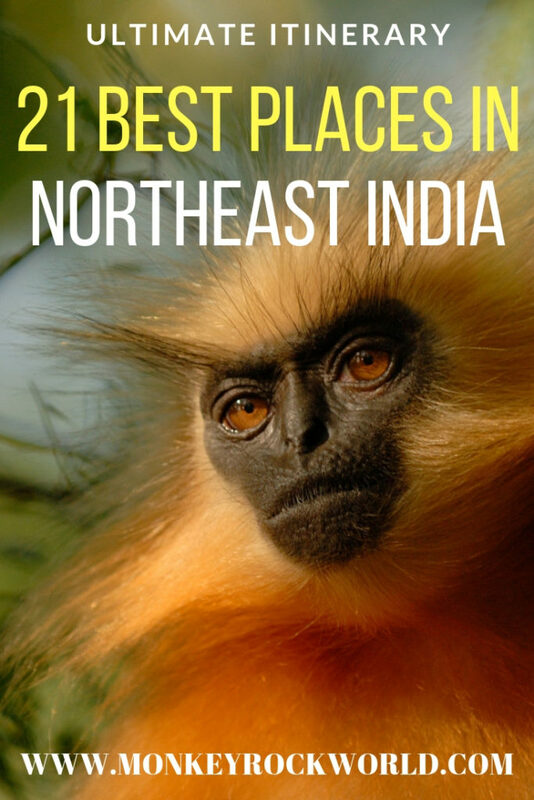 Northeast India’s sprawling metropolis is not the most beautiful, but has a good number of highlights you should add to any Northeast India itinerary. First off, don’t miss the Kamakya temple on top of Nilachal Hill, one of the most revered in the region, where devotees still practice animal sacrifices. Not for the squeamish. 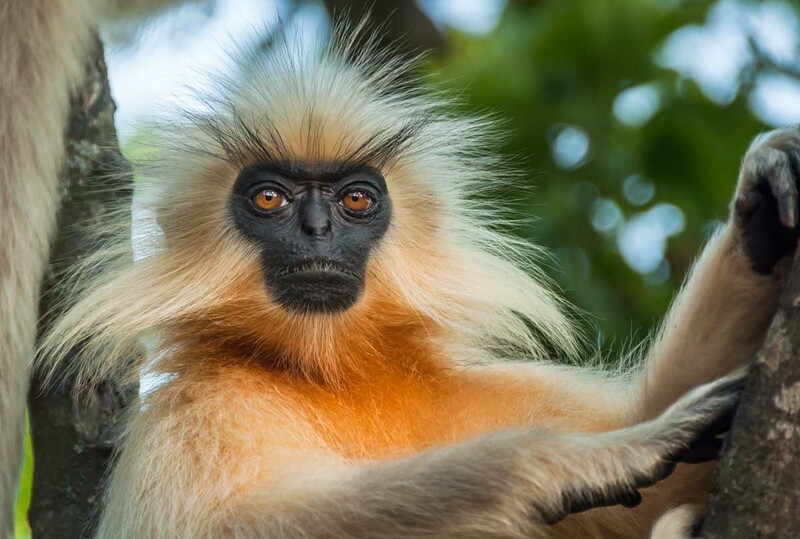 Peacock Island, right in the middle of the Brahmaputra, has another smaller temple, but it’s more recommended to spot the population of beautiful langur monkeys. 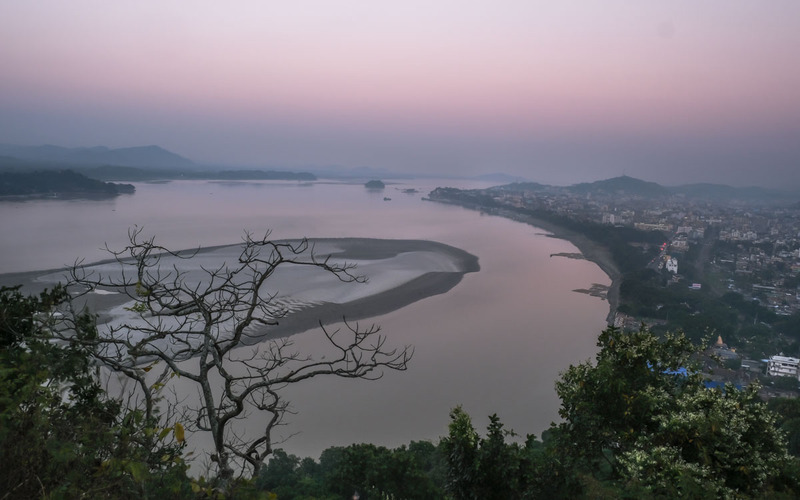 Guwahati is also a good place to get an Arunachal Pradesh’s Protected Area Permit independently, stock up on provisions for your trip, and use reliable Wi-Fi. I didn’t expect much from Tezpur, a small town in the foothills of Assam, on the way to Arunachal Pradesh and the long road to Tawang. Most guidebooks describe it as a simple place that’s good to spend a night and move on, but since the end of the year 2018, there’s much more to be experienced here. Just in front of the Ganesh Ghat is a mostly deserted island which, thanks to the efforts of a group of young students and entrepreneurs, is turning into Tezpur’s main tourist draw: I’m talking about Ugroshore, a new eco-tourism venture set on quiet, grassy meadows, and easily reachable by boat from Tezpur’s main ghat — it’s in walking distance from Tezpur’s bus station. Besides yoga morning sessions, Ugroshore’s guests can enjoy quiet nights under a mantle of blazing stars. Ugroshore also organizes interesting boat transfers to Kaziranga National park, and it’s an ideal destination to bring a family in Northeast India. The biggest riverine island in the world may be shrinking year after year, and yet remains one of the top places to visit in any Northeast India trip itinerary. Home to the Mising tribe and their homes on stilts, it has a series of Vaishnavite shrines. Majuli is particularly happening during the raas leela festival in November, when the bhaona, Assam’s traditional street theatre, is performed all over the island. Actors wear colourful masks as they impersonate the gods and characters of the Vaishnavite myths. This mask-making tradition can still be observed in the satras, or monastic centers, that have kept this art alive since the 17th century. The Natun Samaguri Satra in Garamur is one of the most famous and, even outside of festival season, offers a chance to go see how the masks are built using bamboo, paper and clay. But Majuli is also one of the quietest places in all of India, where you come to experience the slow pace of life on the Brahmaputra. You can rent a bicycle and roam around the island, or just kick back in the handful of characteristic wood-and-thatch bungalows offering great value accommodation to travelers and backpackers. This national park is surely one of the most famous places to visit in Northeast India. It’s populated by wild elephants and rhinos, and it’s on top of the bucket list of most first-time visitors to Northeast India. 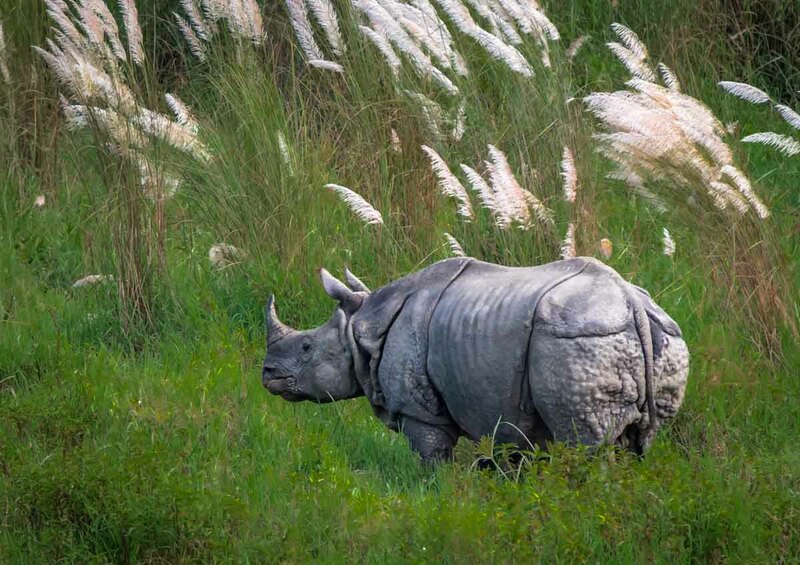 You should definitely go if you have never had a chance to spot the Indian rhinoceros in the wild. But if you do, please refrain from taking a tour of the park on elephant’s back and hope for the jeep. It’s not clear at current whether the conditions in which the local mahouts treat the elephants is fair, and you should do your part to discourage continuing this practice. Shillong, capital of Meghalaya, was once the British main colonial outpost in the region, once grouped under the umbrella name of “Assam”. It’s only a couple of hours away from Guwahati amidst rolling hills, with a climate that’s definitely fresher and wetter than in Assam’s capital. Today Shillong is a busy place and the base of many Indian tourists, who mostly flock to Meghalaya on organized tours to Northeast India, and move around on day trips. But it’s still a pleasant place to chill and stock up on essentials before moving on to the hills — and it’s also the only reliable place in the state to rent a scooter or a Royal Enfield and explore at your own pace. Bustling Police Bazaar packs several bars and cafes, and don’t forget that Shillong is the Indian town with the most solid tradition of rock music and a number of bands — Dylan’s Cafe, entirely themed after Bob Dylan’s musical career, is one example of this strong musical legacy. Dawki, 96km south of Shillong, is touted as an attraction, but it’s not much more than a dusty border post with Bangladesh. 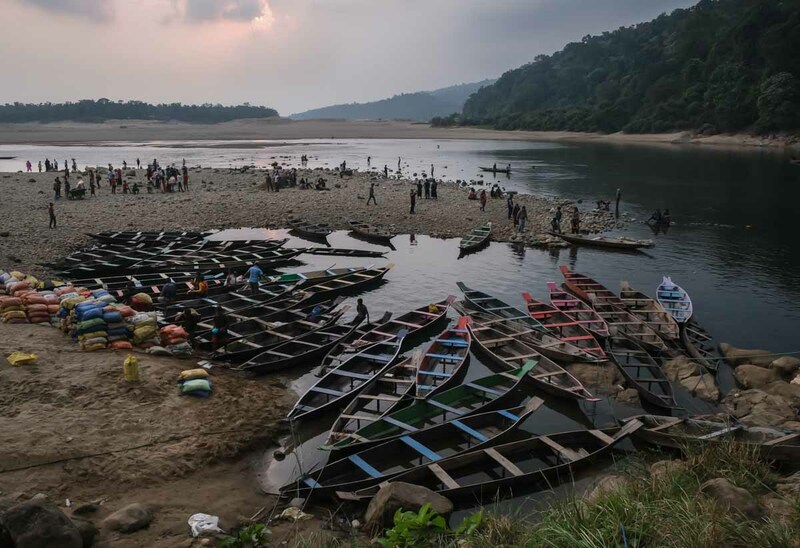 More interesting is the scenic part of the Umngot river that skirts the town separating India from Bangladesh: you can take boats (INR700 for 3 people) and chat with the many Bangladeshis who come here to peddle snacks and souvenirs to tourists. The real attractions here are the suspended-bridge and clear waters of Shnongpdeng, the source of the Umngot river, seven kilometers away. You can travel here with your own transport (rent a scooter in Shillong) or use a tour operator like Pioneer Adventure Tours, staying in one of their riverside accommodations, trying caving, zip lining, rock climbing, rappelling and even scuba diving. Remember that there is no Bangladesh visa on arrival at Dawki — the closest consulate would be in Kolkata, so plan in advance if you are thinking of crossing from India to Bangladesh here. The village of Wahkhen is 56km southeast of Shillong and hides a marvel of rustic engineering. The “bamboo trek”, a long trail made of bamboo, will take you across high ridges and up a tortuous mountain path to the sacred boulder U Mawryngkhang. There’s a 100mt-high ladder that takes you to the top of the rock – don’t climb if you suffer vertigo. It’s interesting to note how the people of Wahken have wanted to build this attraction in order to bring visitors to their village, share the legend of the rock, and generate some jobs for their community. A guided tour costs INR500 per group. 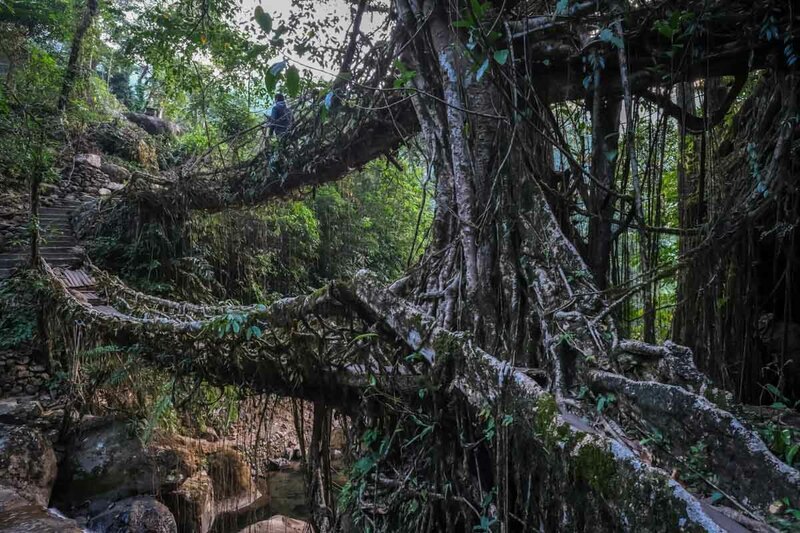 We don’t recommend you visit Mawlynnong, but if you can’t make it to Nongriat, there’s an incredible Living Root Bridge that’s easier to access near here. 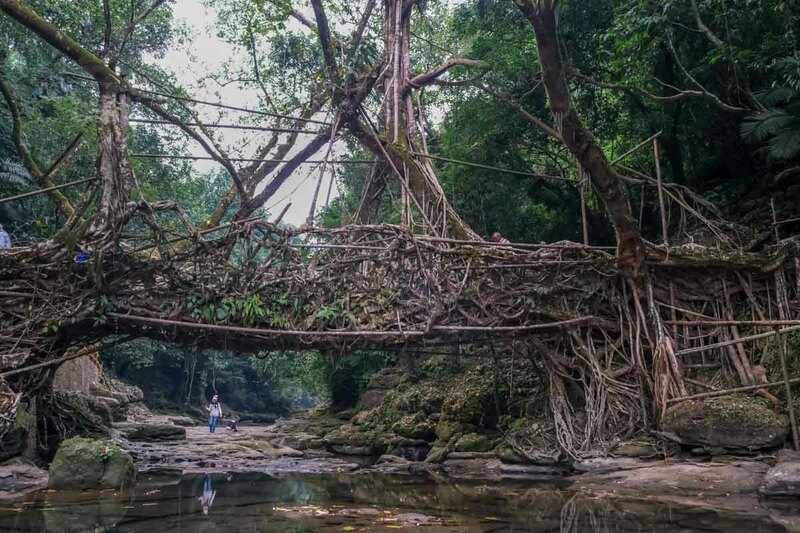 These are real natural engineering marvels, realized with years and years of carefully driving tree roots towards each other to form a natural supporting bridge. In recent years, Mawlynnong basked in the reputation of being “Asia’s Cleanest Village”, and it has become a real tourist trap — they even charge an INR10 entry fee, which is nothing, but adds up quickly, given the number of daily visitors from Shillong. For sure, coming to Mawlynnong is a packed and touristy experience. But if you stay the night, you may still find some of the old quiet and atmosphere this place was known for. When people say Cherrapunjee they refer to the stunning waterfalls around the small town of Sorah rather than the place itself. This is reputedly the wettest place in India, with the highest daily rainfall ever recorded — 104cm in a day in 1876. 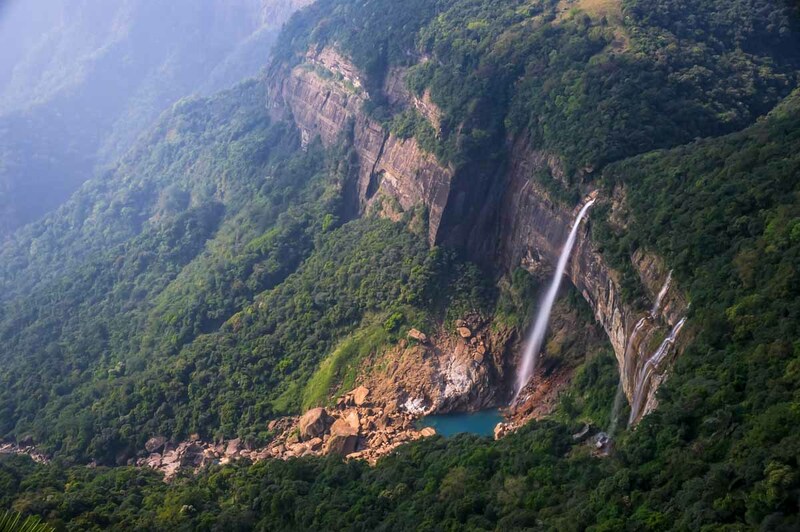 The waterfalls are obviously more impressive during the rainy season: the Noh Ka Likai falls, with their sheer drop and a cascade which becomes double when has rained enough, are possibly Meghalaya’s best known and most abused photograph. If you have your own wheels, you should also brave the drive and hike down to the stunning Weisawdong waterfall, a speckle of azure water nestled in thick tropical rainforest. With a guide and a machete, you could strike off from here all the way to Nongriat like a real Kasi tribesman. This village is hidden at the bottom of an extremely long and steep stone staircase and is a popular day-trip for Indian tourists, who brave the descent and ascent on the same day, just to see Nongriat’s unique Umshiang double-decker living root bridge. It’s much wiser to descend on the first day and stay the night at one of the few homestays that popped up in Nongriat in recent years. Support locals, for living down here is extremely scenic, but it’s also very hard as provisions rely on the outside world, 3,000-plus steps up above. This predominantly Monpa town is 1497mt high and separated into a new bazaar and the much more fascinating Old Dirang, or Dirang Dzong. The Dirang River flows parallel to the highway, next to terraced fields. Dirang Dzong is a cluster of stone houses set around the old, and unfortunately closed, fort. There’s an old gompa inside of the village, where you may see locals dry the endemic hand-made noodles next to a big prayer wheel. Above the town, the 500-year-old Khastong gompa dominates the valley. If you have your own vehicle or can hire a taxi, it’s possible to strike from here to Thembang, a less-visited town with impressive fortified walls, which is bidding for UNESCO inscription. Bomdila, at 2530mt of height, is the first sizable settlement on the way to Tawang, with a bazaar and forested ridges that soar above the town. If the clouds that often shelter the city dissipate, you’ll be able to see the two peaks of Gori Chen (6488mt) and Kangto (7042mt). 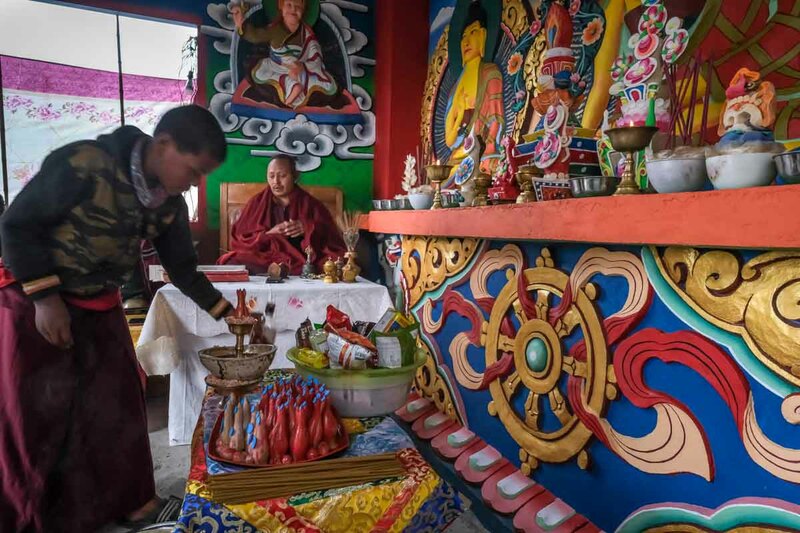 The main attraction here is the Bomdila Monastery, aka Gentse Gaden Rabgyel Ling Monastery, which hosts a spectacular chaam (Tibetan masked dance) in the first half of November. But there are more interesting walks that take you out of the sprawling bazaar and into the surrounding hills. Striking off beyond the town, visit Shiva’s Nag Mandir, with dramatic views over the town. You can then keep on the hiking track to the Rizing Woselling Monastery, a Nyingmapa shrine, with a giant statue of the Second Buddha Padmasambhava sitting on its top. You better come in the morning or early afternoon, when the resident Sange Lama and his young novice monks perform their prayers and rituals, also using human bones and skulls. 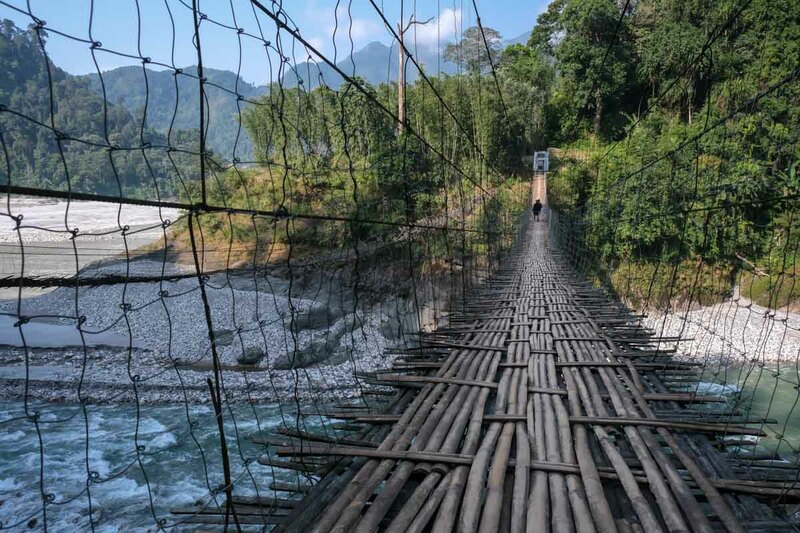 For the most educational experience, local tour operator Holiday Scout organizes private walking tours of their own headquarters Bomdila — and also many other destinations in Arunachal Pradesh and the rest of Northeast India. 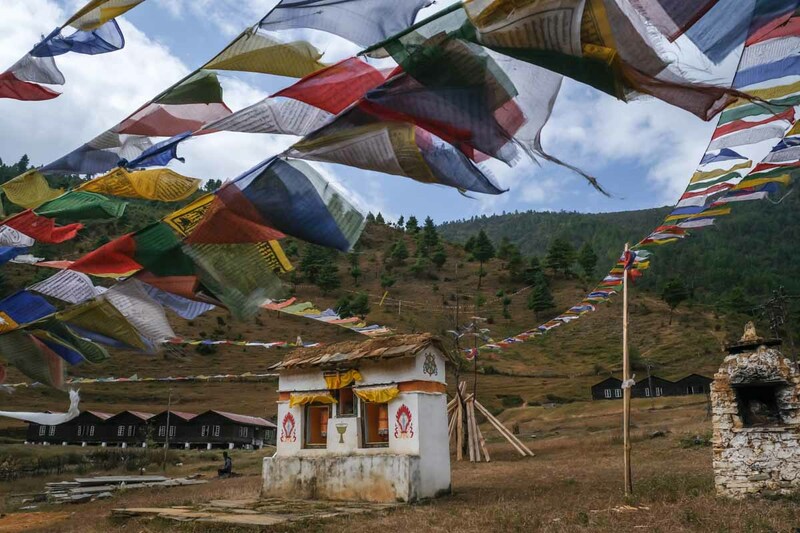 The end of Arunachal Pradesh’s western tourist trail bumps into Tibet. 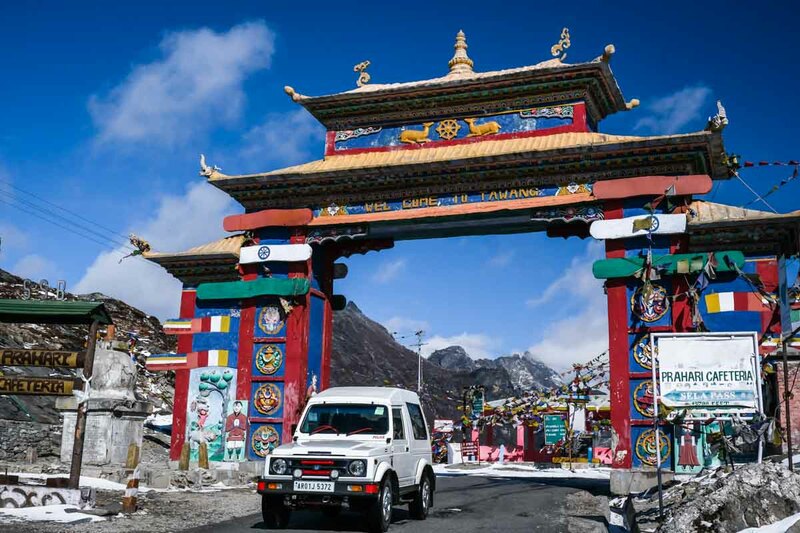 Even if foreigners are forbidden to both visit and cross the border (Indians can visit as a day trip), Tawang is renowned for being one of North India’s most important Buddhist towns. Tawang’s monastery lies on a high cliff as if it were a sleeping yellow dragon, its roof shining like gold under the unforgiving high-altitude sun. You can drive here or take shared jeeps all the way to Tawang town, from where the monastery is just about a couple of kilometers away. It’s a quiet place that shuts very early at night; a great opportunity to rise early, and catch one of the mesmerizing morning pujas that often happen at the temple from 6 or 7 am. Check with your lodging if there are any specific celebrations while you are there. Don’t forget to visit the Urgelling Gompa, just off the main road about 5km south of Tawang town, the birthplace of the VI Dalai Lama. Ziro, a valley set around the village of Hapoli, is better knows as the land of the Apatani people. Pagan by nature, the Apatani worshipped Donyi Polo (the Sun and Moon) and based their lives upon a complex series of beliefs and rituals that you can only understand by hiring a private guide. We recommend Holiday Scout, who organizes guides and photography tours around Ziro and the rest of Arunachal Pradesh and beyond. 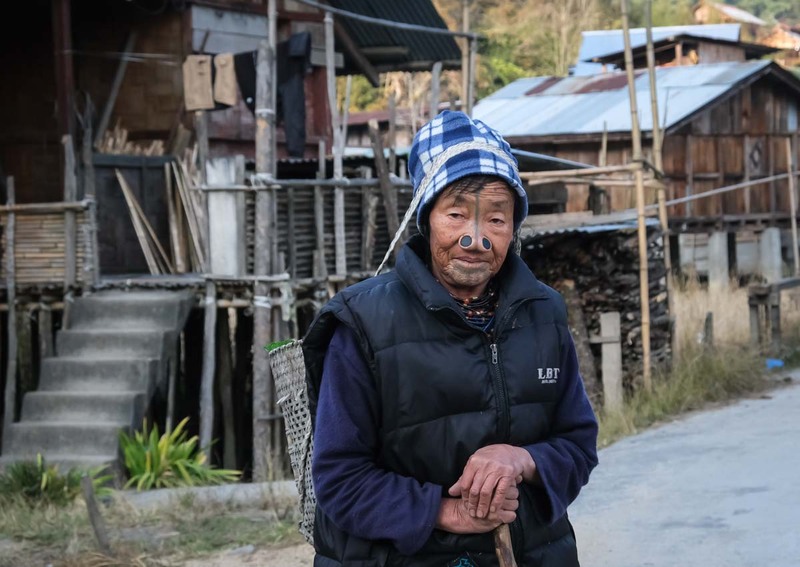 In Old Ziro, a concoction of 6 interconnected villages, you can still see the last remaining Apatani women sporting the tribe’s traditional facial tattoos and nose plugs. Five lines cross the women faces, one from the top of the forehead to the upper lip, and four across the chin. The nose plugs are big and stretch the women’s noses outward. It is said that this was the method used by the Apatani men to avoid that their women, considered the most beautiful in the valley, were kidnapped by the marauding Nishing tribe. This tattooing ritual was banned as inhuman in the 1980s, when the Ziro valley massively converted to Christianity and the missionaries. Visit now, because once these ladies will be gone, we won’t be able to see this tradition anymore. We didn’t know what to expect from Pasighat, and we are pleased to say we had a fantastic experience here. The town itself is pleasant, with a daily market packed with sellers and strange fruits and foods — including rats on a skewer! — but the best reason to come here is staying at The Lhoba. This eco-camp, completely focused on highlighting the local culture of the Adi tribe, has private wooden cottages set on a private orange grove and on a peaceful bend of the Siang river. Between the accommodation and the beach, a sea of elephant grass makes for a perfect foreground to the surrounding mountains. With a set of wheels or on a tour organized by Lhoba, you should go to Ledum village to experience life in the countryside, and see how locals decorate their homes with horns of the Mithun, a local cross between a cow and a buffalo, which has a magical and religious significance. In 10 minutes drive from Lhoba along the road to Yeng Kong is the confluence of the rivers Siang and Yamne. You should come here to have a go at walking on the Ponggang village suspension bridge, which connects the main road to the remote Badak village and its traditional Adi homes. Perched between Southern Nagaland and Manipur, this high altitude valley is a perfect side trip from Kohima. Few travellers still make it up here, but the place is always full of young locals and school groups who come here to hike and enjoy the unique scenery. 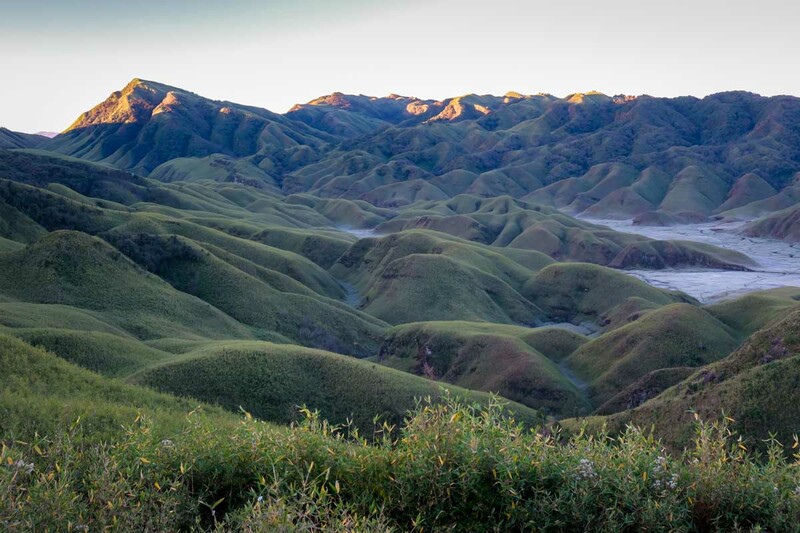 The Dzukou Valley is filled with rolling green hills nestled at the end of a long gorge. There’s only one basic accommodation available (bring your own sleeping bags as the mats and blankets they rent are not enough in the cold months), but staying at least one night is definitely recommended. We visited in December, and even if it was kind of cold, just about 5 degrees Celsius, the spectacle we had in the morning, with ice thawing from the tall grass, and covering the streams, was pretty amazing. You can start your hike from Viswema village (20km from Kohima), from where it’s a 10km walk up the hill to the real starting point of the trek. A taxi will cost about INR1000. Otherwise, a more direct, but pretty much the steepest incline, rocks up the hill above Jakhama village (25km from Kohima). Most people use this route to descend — it takes about 3 hours down, and it’s still a knee-grinding feat. Nagaland’s hill station straddles a wide crest, and it’s an ideal stopover from Dimapur as you prepare for your Dzukou Valley trek. 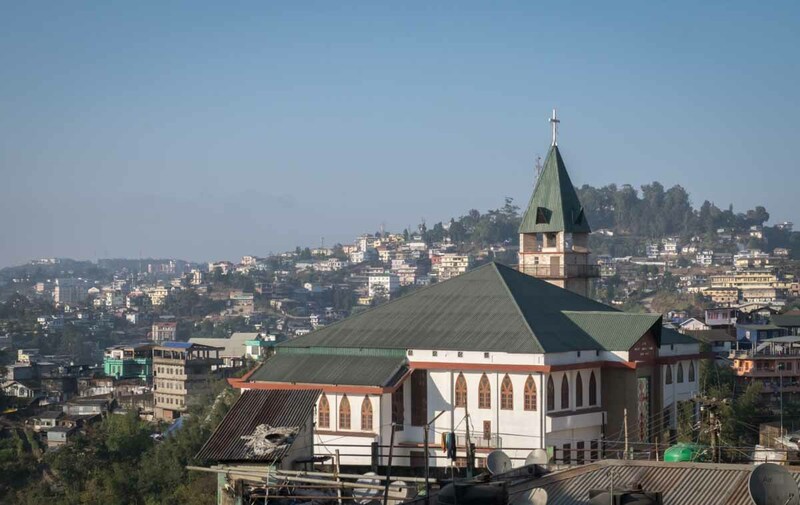 In the upper side of town, Kohima Village still maintains a sense of the city’s past as a colonial hill station, but the city is better known for its modern, buzzing street markets and a series of high-end restaurants where you can try the local Naga food in a more upscale environment. What’s most important, it’s pleasant enough to spend a couple days relaxing and soaking the particular tribal-Christian atmosphere. It’s not far from here that the Hornbill Festival, one of Asia’s top festivals, is held every year from December 1st to 10th. Mon is nestled in Nagaland’s northeasternmost corner, closer to the plain of Assam and lower Arunachal Pradesh than the state capital Dimapur. We visited Mon in 2012, braving a long, rutted jeep track that took us deep into the abode of the Konyak, once famed headhunters. You can still spot some of the elders here, wearing loin cloths and sporting dark facial tattoos and hog’s fangs pierced through their earlobes. But the place has also been heavily evangelized, and next to those leftovers of a tribal past, you’ll also find that the rest of the people have become pretty strict Christians. Don’t forget to visit the village of Longwa, whose headman lives in a house that straddles between the Indian and Myanmar border. You can get to Mon by using a direct local bus from Dimapur or Kohima; or you can travel by train up to Bhoju in Assam, proceed 7km to Sonari, from where there are buses to Mon. Hiring a private car in Kohima or Assam is more expensive, but can save you a lot of time. No matter how you decide to reach Mon, be prepared for an adventure. 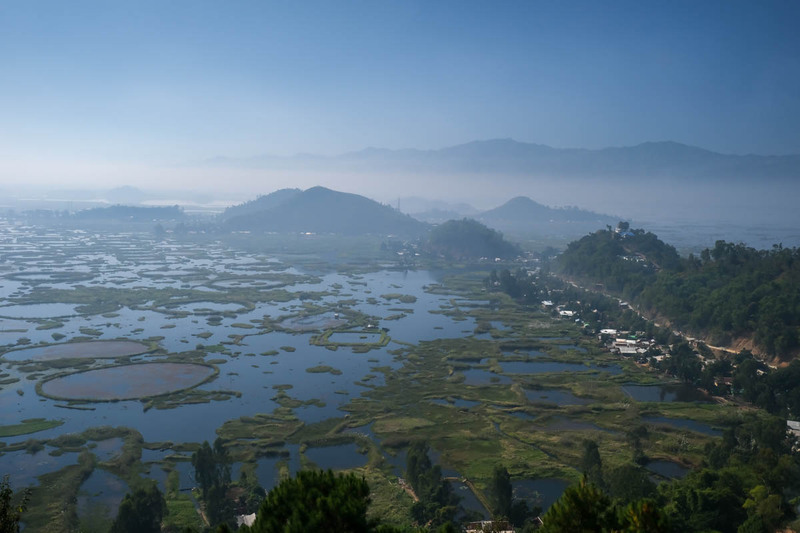 Only about an hour south of Imphal, Manipur’s capital is this very scenic lake, which is part of the Keibul Lamjao National Park, home to the endemic Sangai deer, the symbol of Manipur. 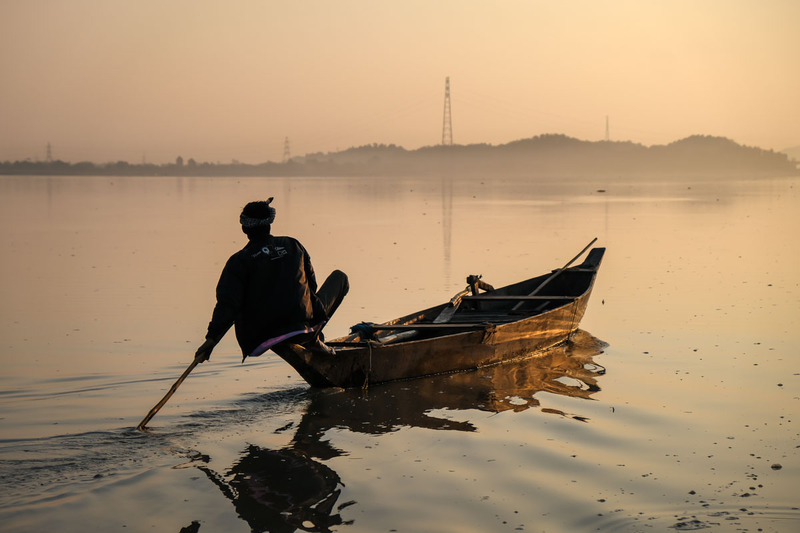 Local fishermen have created phumdis, or circular floating enclosures made with matted vegetation, and used to naturally attract and trap fish. You should come and stay at least for a night, trying one of the characteristic accommodations set on the phumdis themselves. We loved Imphal, capital of Manipur, encircled by distant hills and set over the extensive grounds of what once was the fortress of Kangla. One of the best times to visit is the last ten days of November when the Sangai Festival brings plenty of international performers and events to four different venues scattered around the city. 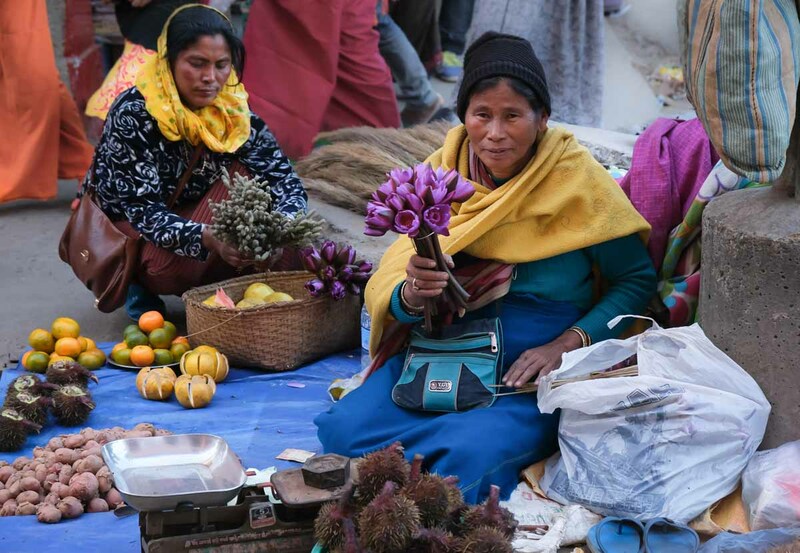 At its heart is the incredible Khwairamband bazaar, also known as Ima Keithel (the mother’s market), four buildings and a kerb full of thousands of Meithei women, who peddle their stuff in the biggest female-run market of Asia. You should also take a chance to travel 25km away to Andro village (take a shared taxi from the Andro Parking at Imphal’s Wangkhai area), at the foot of the Nongmaiching Hills. It’s a heritage village with the interesting Mutua Bahadur Museum, established in 1993, that reproduces model houses of Manipur’s different ethnic groups. The most important sight here, however, is the “Sacred Fire of Andro” housed in the Meitei-styled Panam Ningthou temple, only about 1.5km from Andro bazaar, which is said to have been burning since the 1st century AD. 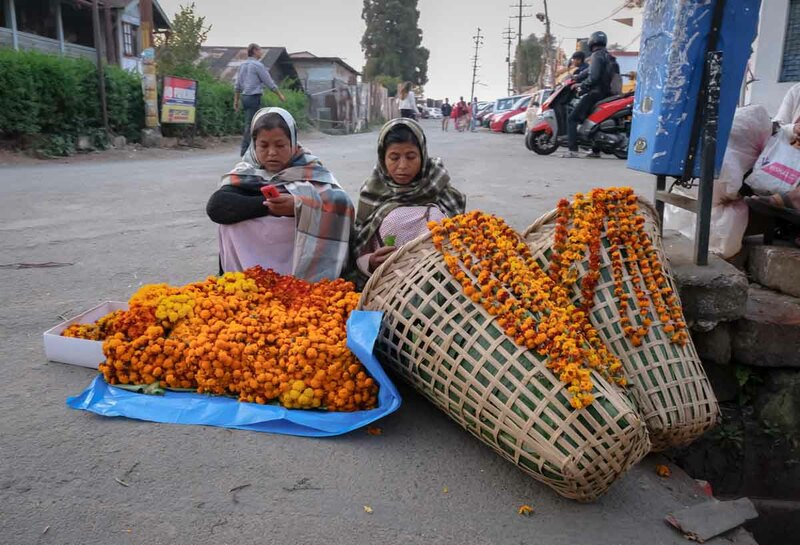 One of India’s smallest states, nestled between Bhutan, Chinese Tibet and Nepal, is considered as the “Eight Brother” to Northeast India’s Seven Sisters. 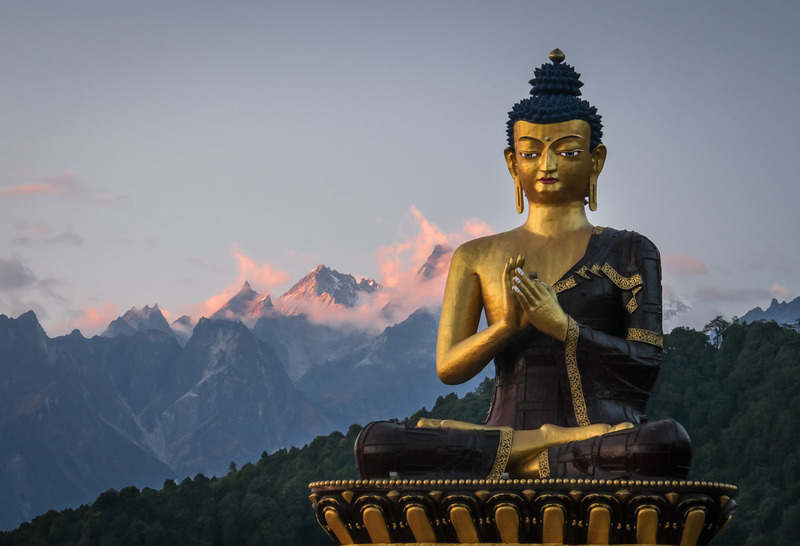 The former Himalayan Kingdom, it shelters one side of Kanchenjunga, India’s highest and the world’s third tallest mountain; Gangtok, a lively yet quiet capital, set close to the Rumtek Buddhist monastery. We already discussed many other places to visit in Sikkim in another post. Please check it out to plan your Sikkim itinerary. PLEASE SHARE THE GOODIES! PIN ME TO YOUR PINTEREST BOARDS! What an amazing list! We’ve only been to Guwahati so far and plan on exploring the rest of the Northeast.